Andy Cohen went back on his vow to ban Lala Kent and James Kennedy from ever gracing the Clubhouse chairs again. 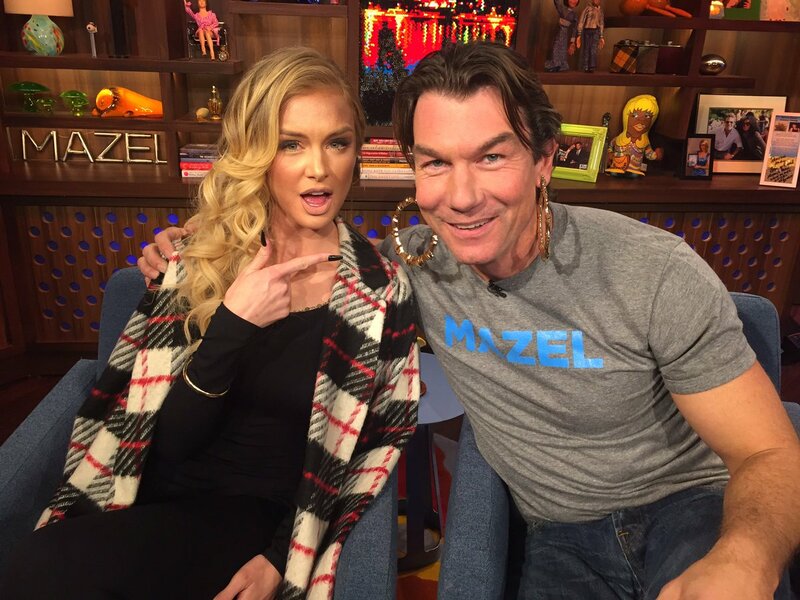 After filming the Vanderpump Rules reunion this week, Andy found it in his heart to forgive over-eager James and Lala for their god-awful first appearance on Watch What Happens Live, and he allowed Lala to come back as a guest tonight – along with Housewives Superfan Jerry O’Connell. Andy opened the show by sharing that he thinks James and Lala were just overtired and super excited to be on the show and then added in alcohol and anxiety and it was a disaster for the censors (and an annoyance for us viewers). 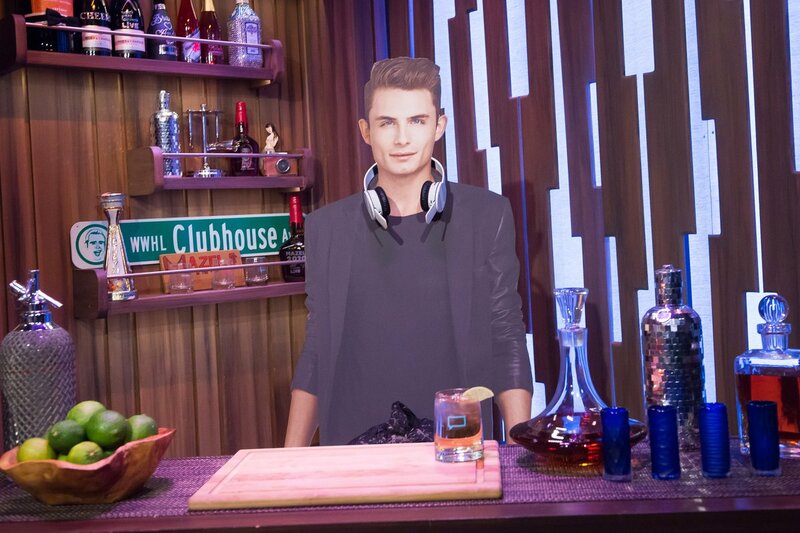 So, Andy’s giving Lala another shot and is also allowing a cardboard version of James be the bartender for the night (photo below). Jerry and Lala participate in a little Clubhouse Playhouse reenactment of the confrontation between James and Lala over tossed salad and I have to say that Jerry does an amazing impersonation of James – accent and all. Jerry stays in his posh accent to say that he thinks Lisa Vanderpump is way too easy on James and he should’ve been fired, not demoted. Lala gives James an 8.5 on a scale of 1-10 on his DJing skills. She says he is good at it. A caller wants to know James and Lala’s status, when the last time she made out with him was AND what does she SEE in him? Lala responds, “the status is we are very much just friends. I cannot even remember the last time we made out, which is a good thing.” And as for what she sees in him, “I just think he’s really funny.” Jerry agrees, saying James is a cute guy. Lala adds that she doesn’t take James seriously and everyone else does. Lala was very well behaved (almost too much so) and only drank one shot of whiskey from the shotski. Jerry was hilarious and Andy needs to get Jerry on at the same time as the other Housewives Superfan, actor Michael Rapaport. TELL US – WHO DO YOU THINK WILL BE THE LAST CAST MEMBER STILL WORK AT SUR YEARS FROM NOW?